October 11, 2013 0 comments on "Mummy Hot Dogs for Halloween"
If you are looking for a quick Halloween dinnertime treat, these mummy hot dogs are really easy to make and you can have them ready for dinner in just a few minutes. Preheat your oven to 375 degrees. Remove the bread sticks or crescent rolls from the package. If you are using crescent rolls, unroll the dough. Do not separate the triangles. Use a sharp knife to cut the dough into 1-inch strips. If you are using the bread stick dough, just separate the bread sticks. 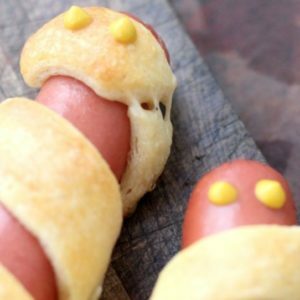 Wrap each hot dog by starting at the top of the hot dog and wrapping the bread stick or strip of crescent roll dough around the hot dog. You should still be able to see the hot dog in between the strips. You want the hot dog to look like you are wrapping it with a bandage. Make sure to leave a spot for the “face” on the mummy, pushing a strip of dough slightly up or down, if necessary. These don’t have to look perfect, they will turn out cute however you wrap them. The dough is very forgiving! 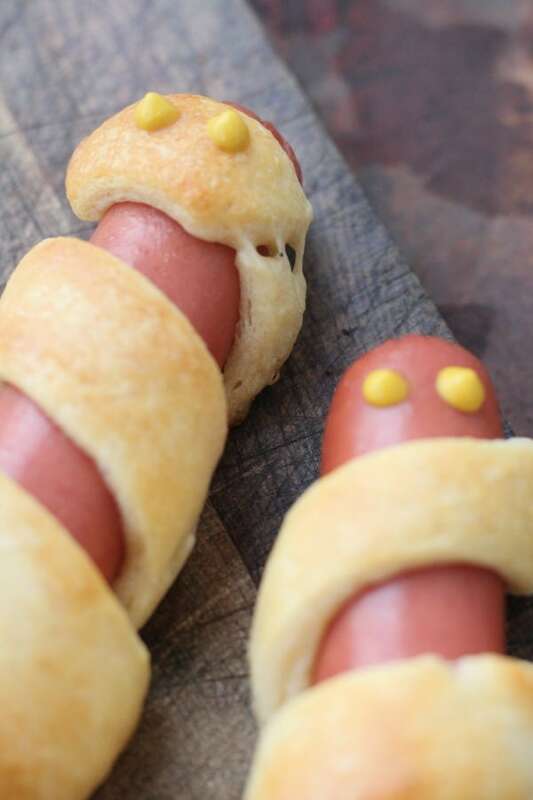 Brush the mummy dogs with melted butter and bake for about 12 minutes or until golden brown. In the space where you left room for the face, add two dots of mustard for eyes. You can also use ketchup, but the mustard eyes stand out better. That’s it! A delicious Halloween meal in less than 15 minutes. You can use any kind of hot dogs for these, but we used the all-beef hot dogs you can get at Costco. They are really good, and I don’t even really like hot dogs that much!